PRODUCT: DOW # 279399 Insta-stik quik, roof insulation adhesive, tank only (23 lbs of adhesive -- shipping weight 31 lbs). Ground shipment only. 40 Kits/Pallet. Note: For large jobs, mfg. recommends One "KIT" for every 4 bottles (1+4) of Instastik. APPLICATIONS: Miami-Dade approved INSTA-STIK™ is a professional polyurethane roof adhesive for attaching compatible roof insulation boards to roof decks and substrates in new commercial construction and roof replacement applications. Applications include insulation board to insulation board, insulation board to Class 1 non-graveled (bald) built-up roofs for recover applications and insulation or gypsum board to 22 gauge and thicker metal and wood decks. Wood Decks: Dow INSTA-STIK adhesive works on wood decks when metal fasteners are not desired. The insulation is securely held without damaging the structural integrity of the wood deck. When the underside of the deck is visible, there are no unsightly fastener points sticking through. 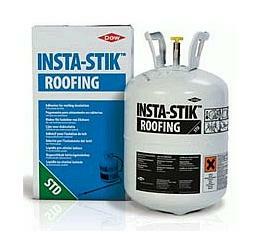 Concrete Decks: Roof top productivity is greatly increased by using Dow INSTA-STIK. No tedious and noisy pre-drilling required. Compatible with EPS (expanded polystyrene) insulation and wood fiber board, INSTA-STIK gives you the ability to choose the right insulation type for the job. Metal Decks: Dow INSTA-STIK is the smart choice when it comes to metal decks. When the project demands that no fasteners penetrate the deck due to electrical conduits, exposed underside of deck, thermal bridging concerns, or environmental conditions, then Dow INSTA-STIK is your Proven Fastener. DOW #294063, REPLACEMENT 4' DISPENSER HOSE WITH ON/OFF VALVE, DISPENSING WAND / COUPLER (tank not included). FOR USE WITH INSTA-STIK BOTTLES. OlyBond 500 Bag-in-Box Kit, Two-part Polyurethane Adhesive. Includes BOTH parts A + B (# OB5001-BAG, OB5002-RBAG). 10 Gallons Total Adhesive. Price/Kit.